Your Mac will automatically restart itself if it freezes, thanks to a new feature in OS X Mountain Lion and Mac OS X Lion. 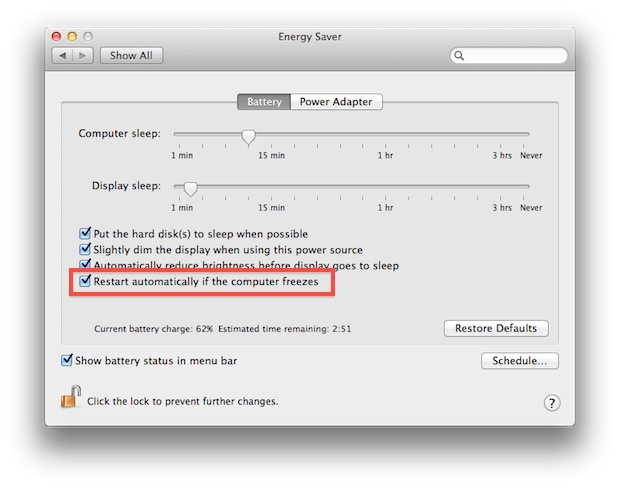 Tucked away in “Energy Saver”, the auto-restart ability is an option that can be disabled if for whatever reason you don’t want your Mac to basically fix itself in the event of a disaster. Macs very rarely freeze, but if you do encounter random freezes and crashes, it may be a good idea to test your RAM for defects. At this point, Mac OS X is so refined that it’s very unusual for the entire operating system to go down or simply freeze, especially with any regularity, so this can be an indicator of something greater than a random one-off freeze. Regardless of the causes of a system freeze, this is a great feature. If you were wondering why it’s tucked into Energy Saver, it’s probably because a restarted Mac can sleep the display and hard drives, whereas a frozen Mac will continue to display the screen and spin the hard drive, wasting energy. This is just one of many new and subtle features tucked into Mac OS X 10.7 Lion, but, curiously, it was removed in later versions of OS X. If you want to adjust the automatic reboot on freeze feature in OS X Yosemite and OS X El Capitan, you’ll need to turn to the command line instead. “This with Resume is a powerful combination,” unless Resume brings back whatever caused the freeze in the first place. This isn’t a Lion only feature. It’s on my Mac Mini running 10.6.8 server. Really? Auto restart in Windows? Though it’s frozen many times, never seen an auto restart in Win 2000, XP or 7 at work. Really? Where might I find this in Windows XP? I have had 3 freeze/crashes since upgrading to Lion. I’ve been a mac owner since 2006 and it seems like I have only had that many since the upgrade. Anyone else having any problems with Lion? Yep, I bought a brand spanking new iMac, had it on Snow Leopard for 2 weeks, the thing ran like a dream. ‘upgraded’ to Lion freeze and crash city. Ridiculous considering the 16 GB of RAM. My Mac Mini freezes daily since the lion upgrade. Must have frozen once or twice in the 2 years i’ve owned prior to the upgrade. and a couple other I can’t think of right now. Rebooting a couple time or more a day – never did before. This is all new with Lion. @Tom that is exactly what is happening to my system! I can’t even go thru my mail app wo getting something frozen…safari doesn’t function as well as it did. have you found any solutions as of yet? Just got a MBA with Lion and get freezes often… rarely got them in Snow Leopard. Wish it were easy to put SL on this thing. I bought an MBP 17″ and it freezes about once a week. The option mentioned above does nothing. MacOS never restarts. The supposed “geniuses” at the Mac store couldn’t find any problems. What a waste of $2500. At least with a PC I would expect to have these kind of problems. I have scheduled restart set on my mac mini with lion – works great however if a user is connected or has been connected at some stage during the day it will not restart automatically. Any ideas on a work around on this one? Freezing is normal on Macs. Crashing, that’s different. using Lion – What about an “F” icon that appears in the status bar on start-up — if you click it, the computer freezes and have to restart by holding down the on-off button for a second. Not everything freezes, and toggle thru applications; mostly it’s the use of the mouse that freeze and any open windows are frozen. Can relaunch the Finder using the keyboard but that doesn’t solve the freeze. Right-clicking on the “F” reveals nothing. but thanks for the Energy Saver tip, to restart automatically if the computer freezes !! that may help, but what about the “F” icon — doesn’t anyone out there know? the fact that someone could say that a mac never freezes is the lie of the century. I just paid FULL PRICE for 2012 mac mini, latest and greatest. It TOTALLY freezes once per week. I first thought it was due to 2 monitors, and the onboard graphics not supporting both monitors. I switched down to 1 and still happens. I get a total full screen-ful of colored pixels, and a loss of keyboard and mouse. Don’t let anyone tell you that Macs don’t freeze. I am a life-long PC user trying to switch. This is my 1st real month on a mac and am ready to go back. Mine used to freeze a lot. Then one night I accidently spilled beer all over my keyboard. (macbook pro) Haven’t had a freeze or crash ever since. 3 months since last freeze.